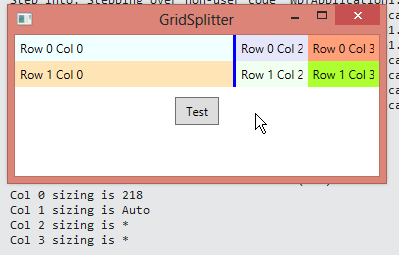 If one of the columns whose size is not changing as a result of using the GridSplitter has its size set to an absolute value, it will retain that value. In the example below column 3 (far right) has an absolute width of 100. The two columns whose size is changing are using star sizing and have had their relative sizes adjusted. 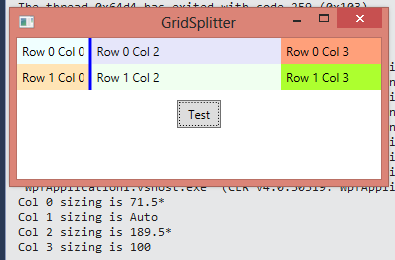 If one of the columns being resized with the GridSplitter has an absolute size, moving the GridSplitter will change its size, but it will continue to have an absolute size. 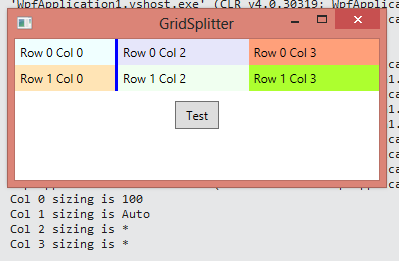 We can see that column 0 has an absolute size if we make the entire Grid wider.